Beloved I AM Presence, and I AM Presence of every person on Earth, I AM of Father-Mother God and the entire Company of Heaven, now as one voice, one heartbeat, one breath, and one energy, vibration, and consciousness of pure Divine Love invoke the most intensified frequencies of God’s Violet Flame of Infinite Perfection that the Earth and Humanity are capable of receiving at this time. Open the Stargates of our Hearts, so we are instantly an Open Door for the most powerful 5th-Dimensional frequencies of the Violet Flame of God’s Infinite Perfection the Earth has ever experienced. Pulse through our Heart Flames and blaze through, and around all inharmonious actions, all lower human consciousness, and all obstructions of the Light that any person, place, condition, or thing has ever placed in the pathway of Life’s perfection. Instantly, transmute this discordant energy cause, core, effect, record, and memory back into its original perfection. 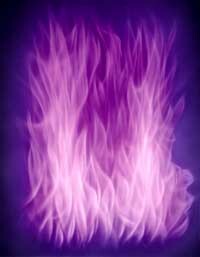 Violet Fire Angels and Lords take strategic positions over every country, state, city, town, village, and hamlet on the planet. Reach out your great loving arms and raise up a limitless number of people in every location who are willing to participate in the faithful use of the Violet Flame of God’s Infinite Perfection. Let each of them understand the full importance of the Violet Flame now being offered by our Father-Mother God to help free Humanity from all human distresses. I AM Presence of ALL Humanity and the Legions of Light throughout infinity, activate the Violet Flame and let it begin to expand and expand. Allow it to merge with the Immortal Victorious Threefold Flame blazing in every person’s heart and explode into a tremendous Starburst of Light. We call forth Omri Tas to intensify the miraculous influx of the Violet Flame and increase it to the power of a thousand Suns. 1. Blaze the Light of a thousand Suns through the physical, etheric, mental, and emotional strata within the bodies of Mother Earth until the elements of earth, air, water, fire, and ether are purified and restored to their pristine beauty. 2. Blaze the Light of a thousand Suns through all of the vulnerable areas in the body of Mother Earth. Reinforce with bolts of Violet Lightning all of the faults, cracks, fissures, tectonic plates, and the wounds created in the body of Mother Earth through nuclear testing, mining, drilling for oil, and every other human affliction. 3. Blaze the Light of a thousand Suns through the thoughts, words, actions, and feelings of every man, woman, child and being evolving on Earth until every person individually acknowledges and accepts the Oneness of ALL Life, and every expression reflects the Reverence of ALL Life. 4. Blaze the Light of a thousand Suns through all incoming babies, the children, their parents, and guardians until ALL youth are raised up in energy, vibration, and consciousness to carry out the directives of their I AM Presence. 5. Blaze the Light of a thousand Suns through all youth centers and activities, all schools, colleges, and universities, all leaders, teachers, instructors, and professors in every line of endeavor until the Flame of God Illumination and Enlightenment is manifest and eternally sustained. 6. Blaze the Light of a thousand Suns through all religions and spiritual teachings, so that Divine Love, Truth, Tolerance, and Universal Sisterhood and Brotherhood will quickly manifest. 7. Blaze the Light of a thousand Suns through all doctors, nurses, healers, hospitals, insurance companies, pharmaceutical conglomerates, and every institution associated with healing of any kind until Divine Mercy, Healing, Compassion, and Vibrant Health are tangible realities for every evolving soul. 8. Blaze the Light of a thousand Suns through all banking and financial institutions, all economic systems, all money, and the people associated with monetary interactions of any kind until every person on Earth is openly demonstrating true integrity, honesty, generosity, fairness, abundance, and the God supply of all good things. 9. Blaze the Light of a thousand Suns through all places of incarceration and all employed there, through every correctional institution, all law enforcement personnel, every judge, jury, and court of law until Divine Justice is manifest and eternally sustained. 10. Blaze the Light of a thousand Suns through all space activities throughout the world until every nation unites in cooperative service, so that God’s Will may be manifest with our sisters and brothers throughout the Universe. 11. Blaze the Light of a thousand Suns through the physical, etheric, mental, and emotional bodies of Humanity until all disease and human miscreation, its cause and core, is dissolved and transmuted into vibrant health, eternal youth, and physical perfection. 12. Blaze the Light of a thousand Suns through the food and water industries and through all of the food and water used for human consumption until every particle of food and every molecule of water are filled with Light. Empower this Elemental substance to raise the vibratory action of Humanity’s physical, etheric, mental, and emotional bodies until physical perfection becomes a sustained manifest reality for every Human Being. 13. Blaze the Light of a thousand Suns in, through, and around every remaining electron of precious Life energy until the Immaculate Concept of the New Earth is manifest, and all Life evolving here is wholly Ascended and FREE. We give Gratitude and Appreciation for this Divine Healing, Thank You. And so it is!